The Stanford Research SR570 is a low-noise current preamplifier capable of current gains as large as 1 pA/V. High gain and bandwidth, low noise, and many convenient features make the SR570 ideal for a variety of photonic, low temperature and other measurements. The SR570 has gain sensitivity settings from 1 pA/V to 1 mA/V that can be selected in a 1-2-5 sequence. A vernier gain adjustment is also provided that lets you select any sensitivity in between. Gain can be allocated to various stages of the SR570 to optimize the instruments performance. The low noise mode places gain in the front end of the amplifier for the best noise performance. The high bandwidth mode allocates gain to the later stages of the amplifier to improve the frequency response of the front end. 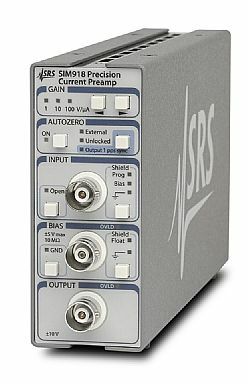 Stanford Research SR570 Low-Noise Current Preamplifier and other Current Amplifiers / Current Probe Amplifiers for sale at Test Equipment Center. Stanford Research SR570 products for sale at Test Equipment Center are thoroughly tested, and receive electrical and cosmetic reconditioning as needed prior to sale. All products include a 90 day warranty from Test Equipment Center to ensure your complete satisfaction. We Buy Test Equipment! Sell your surplus Stanford Research SR570 and other surplus equipment to Test Equipment Center. View our purchase program options HERE. 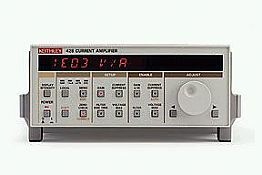 Test Equipment Center sells used Current Amplifiers / Current Probe Amplifiers and Laboratory Test Products from Stanford Research and many other test equipment manufacturers. Request a Quotation for the Stanford Research SR570 from Test Equipment Center now!